As part of our mission to continually challenge, share and advocate for best practice in music education, Sound Connections have commissioned expert early years leader John Webb to undertake research into the role of men in early years music making. 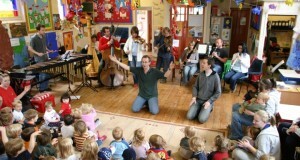 This research will seek to explore what impact กฎmalenessกฏ has on work in early years and what unique behaviours and benefits are demonstrated in delivery of music. We hope to use this study to advocate for more male early years music practitioners, and provide useful support to men who may unexpectedly find themselves in early years settings. As part of this research, John will be conducting some phone interviews and we are looking for male volunteers to participate in the study. Please contact Sound Connections Programme Manager, Julia Roderick, for more information, or if you are interesting in taking part.